What a fabulous idea! 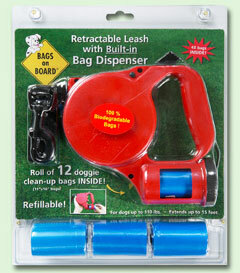 A retractable leash with a built-in bag dispenser. A role of 12 doggie clean-up bags fits neatly inside, making it easier than ever to clean up after your dog. Bramton Bags On Board - Retractable Leash - Red - Small product is categorised under Wholesale Other Brands, WA products, Wholesale Dog Products, Wholesale Collars & Leashes, Wholesale Collars & Leashes. Angel Pet Supplies - Rotterdam Leather "Hearts" Dog Collar - Bubblegum Pink - 16" X 3/4"